Kari Goreng (Dried Curry Flavour), Perisa Sup Udang (Prawn Soup), Perisa Sup Makanan Laut (Original Seafood Soup), Perisa Sup Lada (Pepper Clear Soup), Sambal Udang Coreng (Dried Chilli Shrimp Flavour). Allergy Advice: Contains Crustacean Products. Ingredients: Noodles: Quality Wheat Flour, Salt, Water, Starch. Paste Seasoning: Palm Fat, Cinnamon, Clove, Coriander Seed, Cumin, Star Anise, Sodium Inosinate, Sodium Guanylate, Monosodium Glutamate, Refine Salt, Sugar, Yeast Extract. Soy Sauce Seasoning: Soy Bean, Sugar, Salt, Flour, Brown Sugar, Caramel, Monosodium Glutamate, Benzoic Acid. Seasoning Powder: Salt, Shrimp Powder, Monosodium L-Glutamate, Sugar, Spices, Dry Onion, Hydrolysed Vegetable Protein, Maltodextrin, Fish Powder, Caramel Powder, Silicon Dioxide, Artificial Flavouring Substances, Disodium 5'-Guanylate, Disodium 5'-Inosinate, Acid Regulator, Paprika Oleoresin. Paste Seasoning: Palm Fat, Chilli Powder, Sodium Inosinate, Sodium Guanylate, Monosodium Glutamate, Refine Salt, Prawn Powder, Sugar, Yeast Extract, Onion Powder. Seasoning Powder: Salt, Fish Powder, Monosodium L-Glutamate, Sugar, Vegetable Protein, Silicon Dioxide, Disodium 5'-Guanylate, Disodium 5'-Inosinate, Artificial Flavouring Substances, Acid Regulator. Oil Seasoning: Palm Oil, Shallot. Seasoning Powder: Salt, Sugar, Monosodium L-Glutamate, Spices, Food Starch, Yeast Extract Powder, Artificial Flavouring Substances, Silicon Dioxide, Dry Onion, Hydrolysed Vegetable Protein, Disodium 5'-Guanylate, Disodium 5'-Inosinate, Caramel Powder, Palm Oil. Oil Seasoning: Palm Olein, Shallot. Crispy Shrimp Chilli: Vegetable Oil (Soya Oil), Dried Chilli, Shallots, Garlic, Shrimps (Crustacean Products), Sugar, Salt, Monosodium Glutamate (E621). 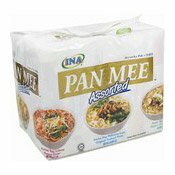 Simply enter your details below and we will send you an e-mail when “Pan Mee Instant Noodles Multipack (Assorted) (什錦板麵)” is back in stock!